It is a familiar creature that constantly moves but is always home. It has a mouth on the bottom of its foot. It has a foot but no leg. The animal leaves a trail wherever it goes. What is it? It’s a snail, of course! Snails are common and unusual. Common, because we all recognize snails when we see them, and unusual, because, in spite of their familiarity, most people know little about them. Snails are ancient creatures. As a group, they’ve been so successful that very few habitats, on land, in water, or near it, lack snails. Snail design is basic: a large muscular body, or foot, with attachments. Everything is connected to the foot. The head and antennae are in front, the tail is out behind, and the shell is on top. The shell has a good deal to do with the success of snails. Snails retract the muscular foot, along with all the other essential body parts, into the shell for protection. Their shells give them cover against environmental extremes like heat and dryness, or from predators. 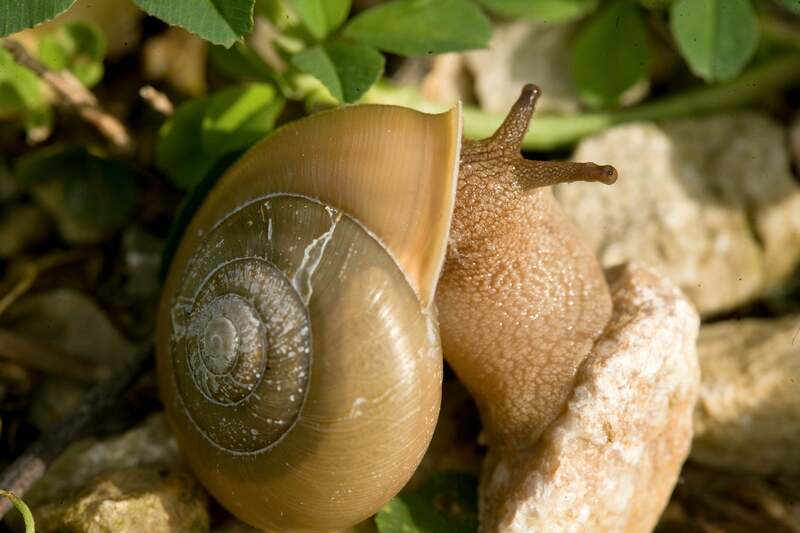 A snail moves slowly and won’t outrun a bird or shrew or hungry ground beetle. But it can hide in its shell and make its soft, fleshy body as unavailable as possible. Material Sourced from former MDC naturalist, Dennis Figg. Most freshwater snails graze on plant material, or sometimes, scavenge on dead animals. If you collect pond water in a jar and place pond snails into it, you will soon be able to see these mouthparts as the snails attempt to forage on the glass. Aquatic snails play an intermediate role in aquatic food chains, eating plants and then becoming food for something larger. Several types of fishes have specialized throat teeth for cracking snail shells. Some birds and other animals eat snails, too.